As of 2018, it’s hard to believe, but the casual cousin of the classic Audemars Piguet Royal Oak is celebrating its 25th birthday. The Royal Oak Offshore arrived in 1993 as one of, if not the original modern oversized watch, adding fuel to a craze that not many at the time saw coming. 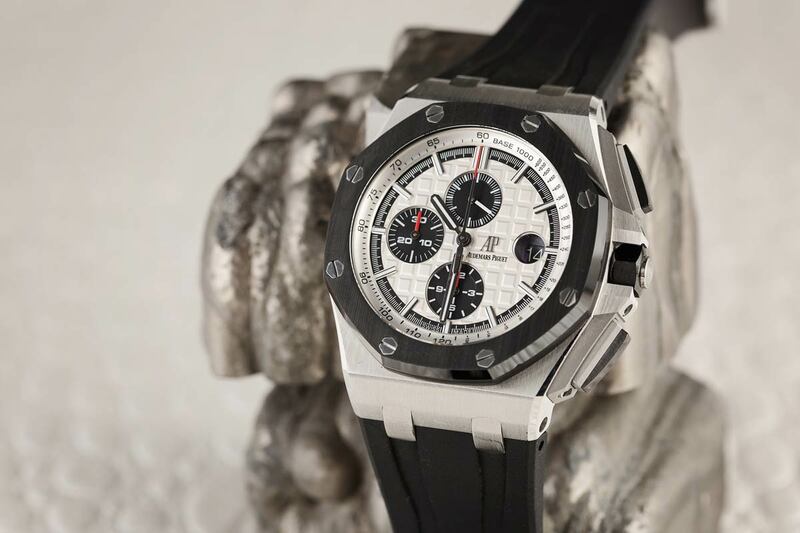 Audemars fully embraced the idea of going more casual than the brand had ever gone before, and after 25 years the Royal Oak Offshore has become a fan favorite for many AP collectors out there. Features that include a modest to moderate water resistance rating, sturdy yet comfortable rubber straps, and a generally more rugged construction than the classic Royal Oak, put the Offshore into a different class of watches altogether, more fit to do battle with things like the Rolex DSSD, among others. The Audemars Piguet Royal Oak Offshore is a fantastic watch. Though the Offshore chronograph has evolved a reasonable amount since its inception, a number of key factors remain a common thread through most iterations of the watch launched in the last decade or two. As the series evolved, one of the more significant changes to come to the line was the creation of the “Mega Tapisserie” dial that arrived in the Offshore line with the first “Themes” models in 2002. Though a simple change—an enlargement of the hobnail pattern found on all of Audemars’ Royal Oaks since their initial appearance on the market—the Mega Tapisserie gives the Offshore dials an increased appearance of three dimensionality, as well as a less traditional overall appearance. These dials have appeared in a wide array of colors and configurations over the years, including an ever-growing line of very colorful Royal Oak Offshore Divers to which the brand added Khaki, Beige, Purple, and Aqua dial colors at SIHH in 2018. 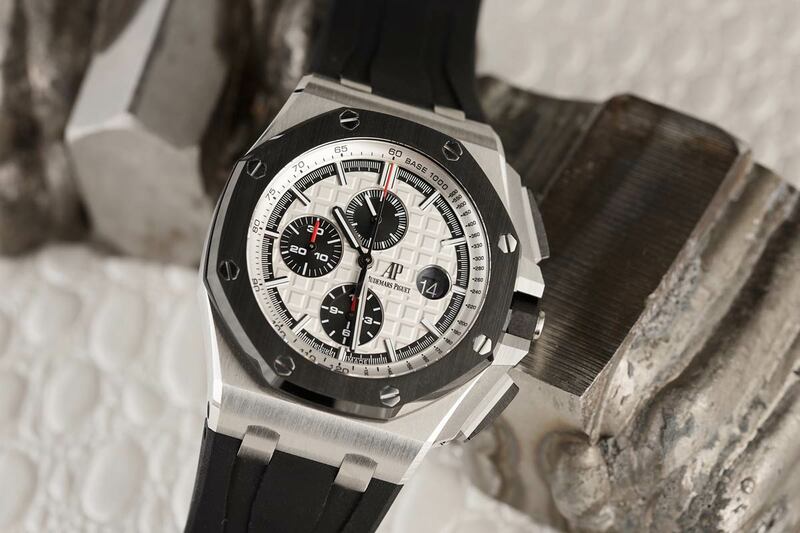 Here is a closeup shot of the Royal Oak Offshore. By and large the dial configuration of the Offshore Chronograph has remained quite consistent through the years as well, at least when speaking of the men’s collection. Its subdials at six, nine, and twelve providing chronograph running hours, chronograph minutes, and running seconds respectively maintain a practical level of functionality without resorting to the more prevalent three, six, nine configuration seen in things like the Rolex Daytona, Zenith El Primero, and countless other chronos out there. The positioning of the minute subdial, in particular, has long been one of the easy points to spot knock-off AP watches, based on how much of the eight and ten indices are cut away (at least on examples with Arabic numerals). Would the Royal Oak Offshore make it to the list of your favorite chronographs? 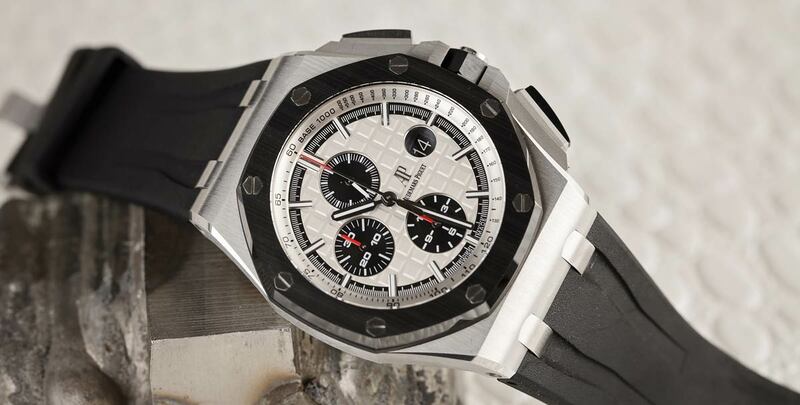 Without getting into the groundbreaking and over-the-top Royal Oak Concept pieces, it’s safe to say that a great deal of innovation has gone into the Offshore line, especially when discussing use of materials. Going back to 2002 (again), AP was the first brand to use a rubber cover/coating as one of its main components, in this case covering either steel or 18k rose gold bezel as well as its pushers. This unorthodox design, especially in the case of covering up gold, was a surprising choice at the time, however given the idea that the Offshore is meant to be a rough-and-tumble luxury watch that can handle the abuse of adventure, the material makes a fair bit of sense. This is by no means the only materials innovation to surface from AP in the Offshore line. Ceramic has been playing a major role in recent years, as you can see on the bezel, crown, and pushers of the Offshore Chronograph we’re featuring here. A fully ceramic-cased Offshore Diver surfaced in the collection back in 2013, as well as the highly coveted forged carbon example with yellow accents released in 2012. 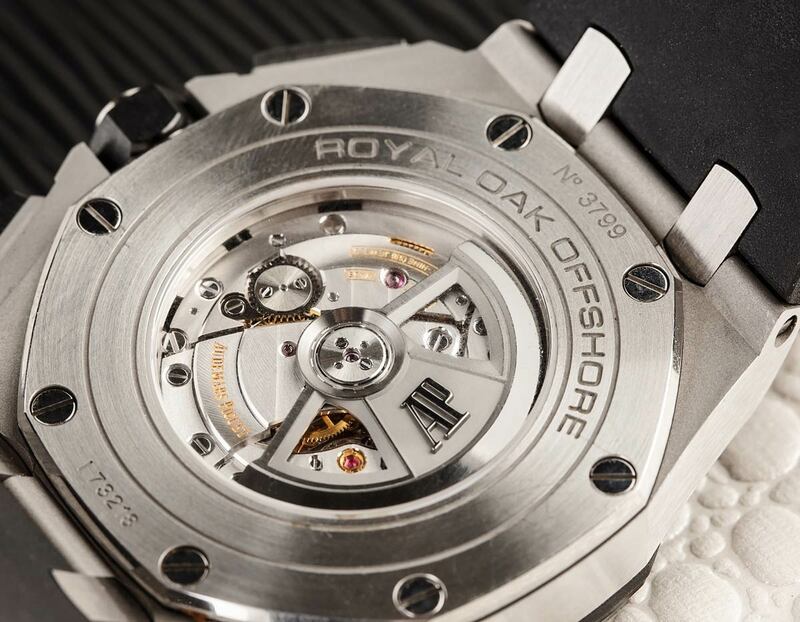 The back features a clear seethrough caseback to see the inner workings of the Royal Oak Offshore. When it comes to the ref. 26400SO Offshore Chronograph we’re looking at today, this is an example that ticks a lot of boxes. It features a much-loved “panda dial”—a white dial with black chronograph subdials—complemented nicely by black ceramic accents on its 44mm steel case. 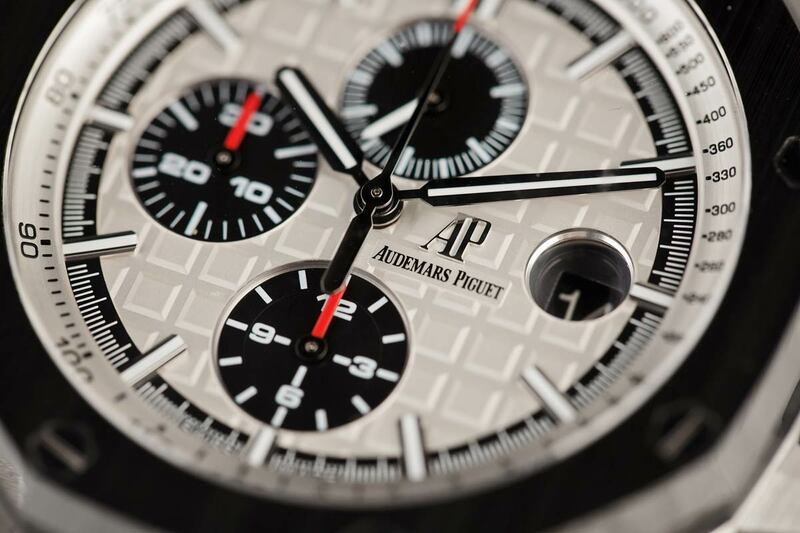 Powering this chronograph is the Audemars Piguet 3126/3840 self-winding caliber, which offers a 50-hour power reserve. The caliber was first introduced in 2007 and now powers all of the chronographs in the line. Audemars Piguet uses their in-house 3120 caliber as a base, then fitting it with a heavily modified Dubois Depraz chronograph module. This example uses a skeletonized blackened rotor rather than the more conventional gold rotor seen in the standard Royal Oak line. What I’m personally fond of with this particular Royal Oak Offshore aside from its general versatility is its dial configuration. Though the Arabic numeral dials are rather cool in person, I’m less fond of the way the numerals are intercepted by its subdials. By using applied baton indices, not only is this detail avoided entirely, but its dial now appears far less cluttered, and allows its wearer to further appreciate the details of its Mega Tapisserie. What are your thoughts on the Royal Oak Offshore?